Last night, Argentina got 50 billion pieces of good news, when the IMF agreed to provide the troubled Latin American nation with a $50BN standby loan, the largest even in IMF history. It also got some bad news, when the central bank announced it would remove the 25/USD barrier it had imposed in early May to prevent an escalating currency crisis. 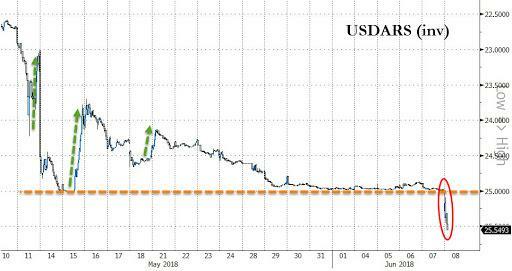 Well, this morning, contrary to expectations that the Argentina Peso would rise on the IMF loan, ARS resumed its selloff, and promptly breached the central bank's 25/USD barrier, and plunging 2.3% to 25.55 . Meanwhile, there is the political blowback to consider: as Bloomberg notes, after the kneejerk reaction and market stabilization at a new level - assuming there is one - traders will start watching the steps govt will make to achieve the new fiscal targets as Argentina is well known for protests, and the latest round of IMF austerity in the form of cuts in jobs and government spending is unlikely to be achieved peacefully. Meanwhile, as Bloomberg's Sebastian Boyd writes, "given the pace of inflation, the peso needs to weaken just to maintain the real exchange rate, and arguably it should fall more than that. But today is going to be interesting. 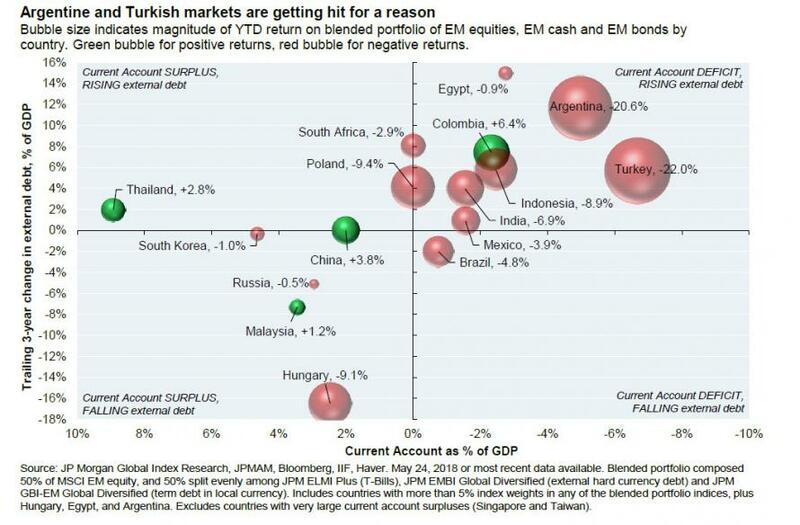 It looks as if the market wants to test the bank's resolve again." As we reported yesterday, Argentina will seek a fiscal deficit/GDP of 2.7% this year and 1.3% in 2019; below the previous targets were 3.2% and 2.2%, respectively; the country is expected to balance its budget in 2020. Ironically, even as the Brazilian real is stabilizing, for now, after last night's central bank intervention, the EM selloff in Latin America for now has merely jumped borders across to Argentina. The question is whether the central bank will be forced to intervene again. 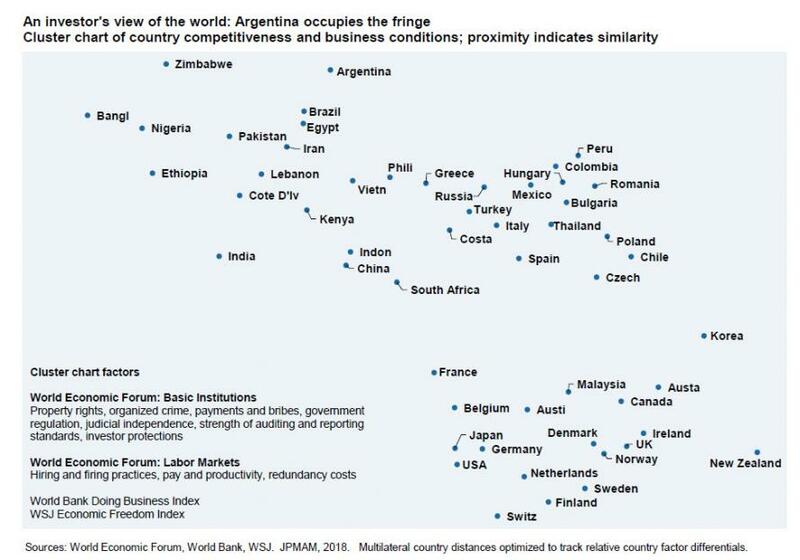 Putting Argentina in context, JPMorgan's cluster model illustrates how risky the Latin American country has been for investors. In the chart below, the closer countries are to each other, the more similar they are with respect to competitiveness, regulation, investor protections, labor markets and ease of doing business. Like Bangladesh and Zimbabwe, Argentina lies at the outer edge of this known universe, far from other EM countries like China, Peru, Indonesia and Mexico and Vietnam, and lightyears away from the developed world. Only in a world of financial repression by central banks could a country like this issue an oversubscribed 100-year bond.